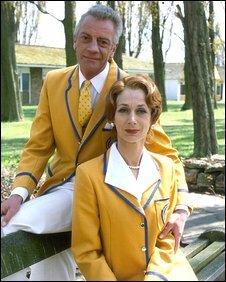 Holland with her on-screen husband Barry Howard in Hi-De-Hi! Comic actress Diane Holland, who played condescending dance instructor Yvonne Stewart-Hargreaves in holiday camp sitcom Hi-De-Hi!, has died aged 78. The star had a long career on stage and screen, with roles in Crossroads, Casualty and Some Mothers Do 'Ave 'Em. She had been suffering from bronchial pneumonia and died on 24 January. "She had a very dry sense of humour, extremely kind-hearted," said her agent, Bo Keller, adding: "I miss her very much." Holland's character in Hi-De-Hi! was a former ballroom dancing champion, horrified at having been reduced to working in a holiday camp. Along with her screen husband, Barry, she fought to preserve her dignity against the backdrop of donkey races and drab living quarters. A typical episode saw the pair forced to put on a children's show, grimacing through a play about "drinking a glass of sunshine" while dressed as a pixie and a fairy. Although they were largely incidental characters in the series, Yvonne's snooty asides - "Barry, don't be so common" - were often a highlight of the show. However, the actress said she was "not at all" like her character. "I would hate people to think that," she said. Keller agreed, saying his client had been "a joy to look after". "If any of the youngsters coming in today were like her in terms of attitude, this would be a wonderful profession to be in," he added. "She was a real trouper. You could throw anything at her and she'd do it." Holland started her career in musical theatre and, until recently, performed Christmas recitals at the Royal Opera House in London. One of her favourite roles was that of the maiden aunt in the Royal Ballet's TV production of The Nutcracker. 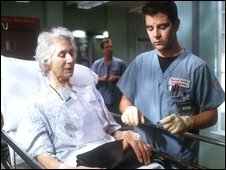 She also turned her hand to dramatic roles, winning critical acclaim for her portrayal of a terminally ill patient in Casualty. Holland's sister, Gilda Perry, is also an actress and is married to Hi-De-Hi! and Dad's Army scriptwriter Jimmy Perry. A private family funeral will be held on 28 February, followed by a public memorial "in the spring".